The 150w Kudox electric towel rail provides independent bathroom heating and towel drying for small bathrooms or wash rooms. Featuring a traditional ladder design and chrome finish, this bathroom radiator complements a range of interior design styles. View Kudox 150w Chrome Straight Towel Rail datasheet here. View the Kudox Thermal Fluid Towel Rail manual here. View the Kudox Wall Controller manual here. Controllers and towel rails for bathrooms, cloakrooms and wet rooms must be professionally installed by a qualified electrician and are not sold as a DIY product. Always defer to the manufacturer’s guidelines about the bathroom suitability of any product. Kudox towel rails come with a pre-fitted electrical element. This element may be on the left or the right-hand side of your towel rail. If you wish, you can remove the element and switch it to the other side of the towel rail. However, this is a job for a professional electrician and all manufacturer’s instructions must be followed. This product comes with a 1 Year Manufacturer's Warranty (subject to manufacturer's terms and conditions). Kudox towel rails and controllers are available with free next working day delivery. You can choose your delivery date from our calendar at the checkout. Next working day delivery dates are available when you order before 12pm (excluding weekends). This towel rail uses an energy-efficient thermal fluid element to make your bathroom and towels toasty in no time at all. The thermodynamic liquid inside the Kudox 150w has superb heat retention, so it can easily maintain its temperature without using a lot of energy. This model of the Kudox 150w comes with a chrome plate finish and sports a simple, straight-bar design that will enhance the look of any bathroom. 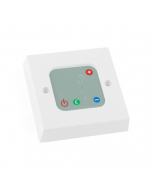 For extra safety, this product is thermo-fused and comes with a high IP55 ingress protection rating, making it suitable for installation in zones 1 and 2 of your bathroom. The fitted depth of this rail comes to 79mm once attached to the wall brackets. Kudox towel rails are available with an optional heating controller to provide easy heat management and to help limit energy usage. The Kudox Controller allows you to incrementally adjust the output of your towel rail, as well as access a 2-hour timer function to restrict its running time. Colour-coded LED lights on the controller make it easy for you to see the current settings, and with its IPX4 protection rating, you can install it in your bathroom with confidence. All Kudox towel rails come with a 1 Year Manufacturer's Warranty. All fixtures and fittings are included as standard. Installing an electric towel rail is a fairly quick and easy process but must always be carried out by a professional electrician.